Lock in a great price for Crowne Plaza Doha West Bay – rated 8.5 by recent guests! The hotel location was in the center of the city, hence, everything is quite within reach, i.e parks, a walk in the sea side, malls, supermarkets, sports facilities, etc. Very clean and spacious rooms, well kept hotel. They have very good breakfast. Crowne Plaza Doha West Bay This rating is a reflection of how the property compares to the industry standard when it comes to price, facilities and services available. It's based on a self-evaluation by the property. Use this rating to help choose your stay! Located in West Bay, Crowne Plaza Doha West Bay is a 5-star property that offers elegantly furnished room with free WiFi. It includes an outdoor pool, a spa and a gym. All the rooms at Crowne Plaza Doha West Bay include a flat-screen TV and a mini-bar. The suite is fitted with a living room. The bathroom includes a bath or a shower. At Crowne Plaza Doha West Bay, there are 3 restaurants and various bars and lounges. Guest can enjoy at delicious Indian restaurant Signature by Sanjeev Kapoor and a Mediterranean restaurant. When would you like to stay at Crowne Plaza Doha West Bay? This twin/double room features a seating area, tumble dryer and mini-bar. 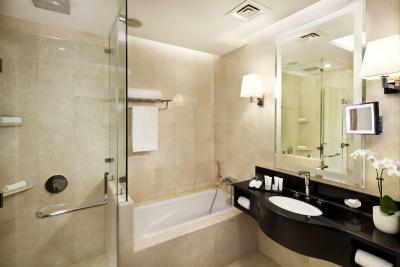 This double room has a mini-bar, bathrobe and tile/marble floor. This suite has a bathrobe, cable TV and sofa. House Rules Crowne Plaza Doha West Bay takes special requests – add in the next step! Crowne Plaza Doha West Bay accepts these cards and reserves the right to temporarily hold an amount prior to arrival. Please note when booking more than 8 rooms, different policies and additional supplements may apply. The staff is amazing, also how clean is everything. Gym is quite small for that kinda hotel...and the swimming pool not well maintained...and no Steam & Sauna & Jacuzzi in the hotel, you have to pay extra for those facilities which are available to other hotels which is even cheaper room rate! Staff exceptional and very professional. Very modern and well equipped. Would stay there over and over again. nice and very clean hotel.. it's in center of DOHA. The location is awesome and 5 minutes aways from city center, staff was very helpful specially Mr. Jamsheed and Mr. Rahim at Reception both were awesome and very very helpful they showed me couple of rooms before check in For which I appreciate them. Over all experience was awesome. I m planning soon to stay there again. Some staffs are not able to respond immediately to the customer's.. the Egyptian call ahmed one of them. The net is not working. The view is not as nice considering all the construction going on around the hotel.